• Conventional Full Dentures - This is when all the teeth are removed and the tissue is given time to heal before the dentures are placed. It could take a few months for the gum tissue to heal completely, and during this time you will be without teeth. 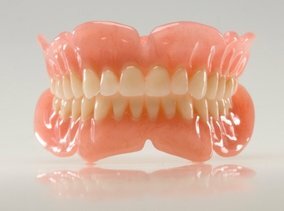 • Immediate Full Dentures - Prior to having your teeth removed, measurements are taken to fabricate dentures fitted for your mouth. After removing the teeth, the dentures are immediately placed in your mouth. The benefit is that you do not have to spend any time without teeth. You will, however, need to have a follow up visit to refit your dentures because the jaw bone will slightly change shape as your mouth heels. The dentures will need to be tightened after the jaw bone has healed. • Partial Dentures - are another option when not all of your teeth need to be removed. This is similar to a bridge, but it is not a permanent fixture in your mouth.